Ever heard of Bertie Bott's Every Flavour Beans? Those who are Potterheads will sure know about this. I didn't know what it is till Mamarazzi told me about this boy, Harry Potter. He is the hero in wizarding world and in his school they have these Every Flavour Beans. A friend had just came back from Japan and surprise surprise......goodies for us. paiseh paiseh...Thank you very much, Manglish. 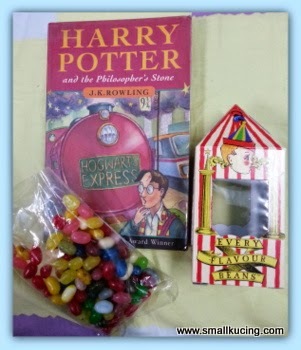 Among the goodies was a box of Bertie Bott's Every Flavour Bean. How colourful they are......sure to taste good, right? Got a "guide" here but all written in Japanese . After one black pepper and ginseng tasting beans, Mamarazzi google and found the English translation. Ohh....the ginseng one actually is "dirt". While the vegetable tasting one is actually "Grass". Soap ones still bearable la. But the rotten eggs ones are super yucky. Dare to try one? This could be rotten egg or lemon.....take a guess. Not sure but when Mamarazzi write this post , she saw that some can get from Singapore. Friend bought from Universal studio in Japan. so the one in Singapore maybe have kot? Ewwww, this is so gross! I have not seen them here. Have you read the Harry Potter books or watched the movies? You are BRAVE to try them! I think I would GAG! Nope I have not read Harry Potter books but Mamarazzi had read all the books. Even queue up for the last book when it was released. I have watch HP movie. Nice? Can do magic.....or become a wizard after eating them? Hehehehehe!!!! 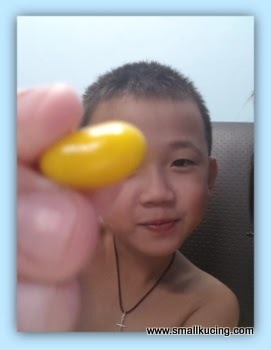 Never heard before but after seeing the pictures, ooooo jelly beans! Wah got different flavour and meaning for different colour.. Interesting wor.. I want to try the rotten egg one, sounds unique, dunno made of wat leh hor.. sure???? Mamarazzi sort out some and post to u??? No thank you on the orange vomit taste jelly bean. I will let you have them all. Wah first time reading about this.. confirm I'm not Potterhead. LOL! I wouldn't want to taste the dirt beans! LOL......what about the rotten eggs, worms and vomit ones? Which one u like best? I don't think I would be brave enough to try these beans. I saw before in Mercato, Pavillion. But that was a long time ago, not sure if they still have it now. Tsk, why your friend name is Manglish? Nickname? 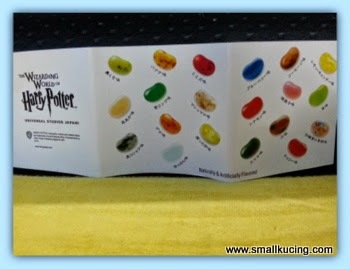 I saw the Every Flavoured Beans on sale at the Potter exhibit gift shop when it was in Singapore (small boxes only) that everyone else bought few years ago. 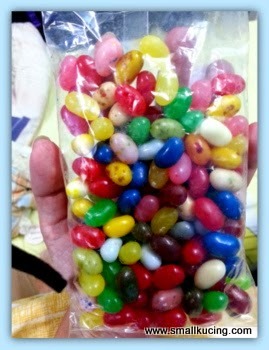 I already tried those years ago (I have the huge container in my room); they're okay, but jellybeans not my jam (haha). Your bag no booger-flavoured one ah? HAHA... Haven't seen them in Malaysia, not even in the Potter heyday. 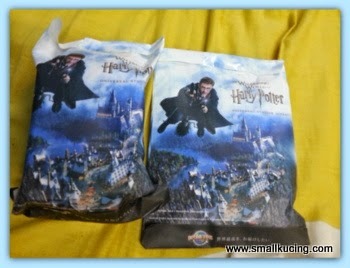 Guess if want some more have to go to the Potter themeparks baru ada..
maybe have booger flavour one but i haven;t come across yet. Just ate a few only. LOL..
Wasey... really got the awful ones? Thot just a sales gimmick to call them those names. Eww.. I wouldn't dare to try. Given free, I also lari. Ahaha. Too cute! Wanna share some with me?? Wah, the Harry Potter, the them park, I heard my friend said there're very crowded, because it's just opened on last year July, so everybody around the world are rushing to see it!! Really! I wonder what they use to make the jellybeans with taste of vomit. Never heard of all those intriguing names the beans are known as. Was in Japan last month but never saw them. Hi Small Kucing, thank you for visiting my blog. You are so cute! Very interesting blog, now I can also visit your blog. About the mulberry leaf tea, I have read that it need to be boiled and dried first before making into tea. Anyway I myself have not tried it yet, nor have consumed the tea before. How do you intend to make your mulberry leaf tea, do you mind sharing with me? Thinking of drying the leaves and keep. Like chinese tea. Heard from pasar malam vendors that the leaves ca be used to make "leong sui" too. Thank you for sharing info on how to make mulberry tea..will like to try it out. Also would love to follow your blog. Eh! So long I didn't hear this Uncle Manglish's name! I remember this blogger. 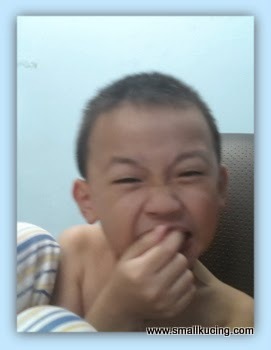 Hey boy, brush your teeth kuat kuat after taking so much colourful sweets ok. If mamarazi forbid you to eat so much sweets, pass to me quick! Hi Raven. Sorry, I don't know the price as it was a gift from a friend. Didnt ask him the price.